How to paint furniture. Everything you need to know to repair, prep and paint furniture like a pro! 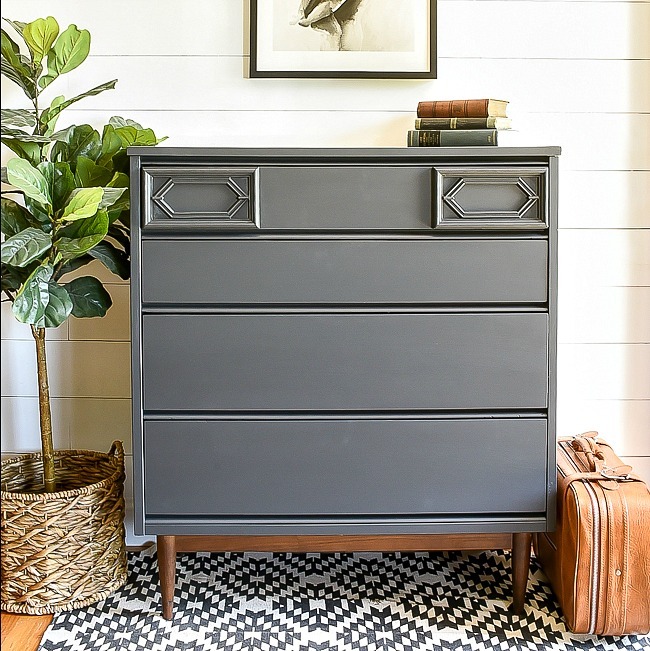 I've sanded, prepped and painted furniture more times than I can count, so it's about time I share my favorite basic tips and tricks for painting furniture like a pro. 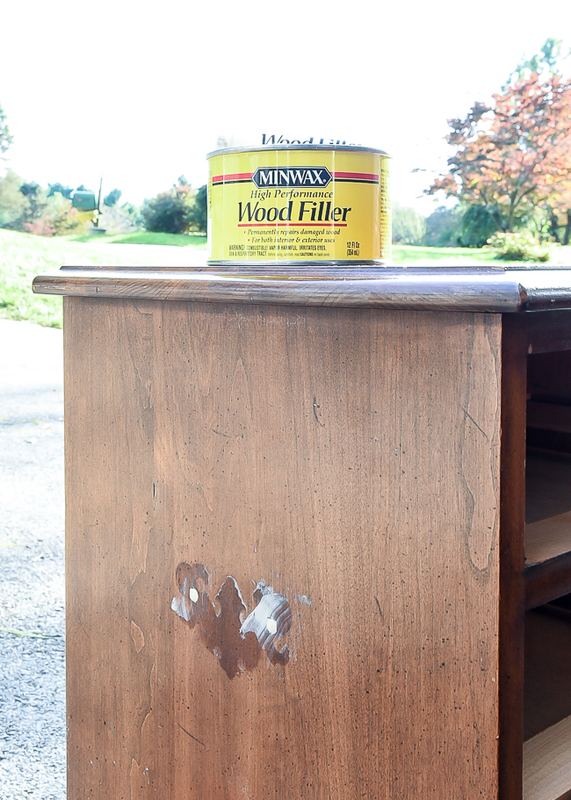 From the best wood filler for filling old hardware holes to how to paint laminate furniture. 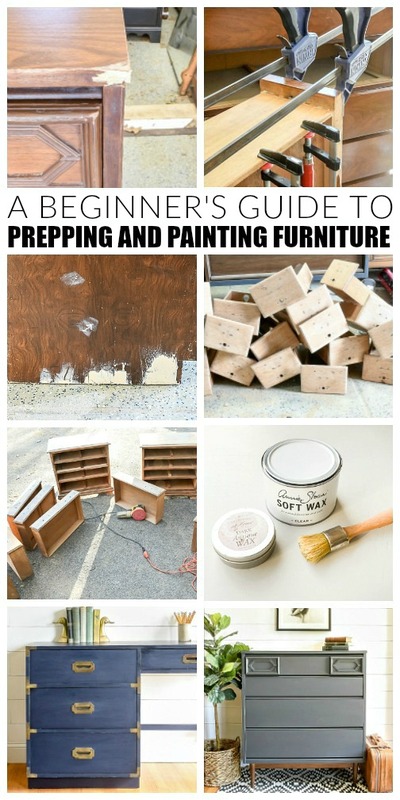 I hope to answer all your basic furniture painting questions in this beginners guide to painting furniture. 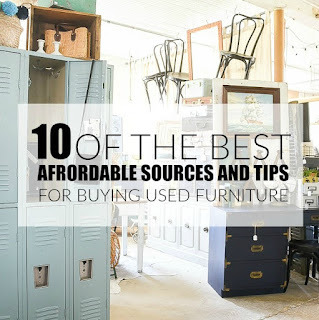 Before I get to all the nitty-gritty of prepping and painting furniture, I wanted to share my favorite sources for scoring awesome deals on used furniture. 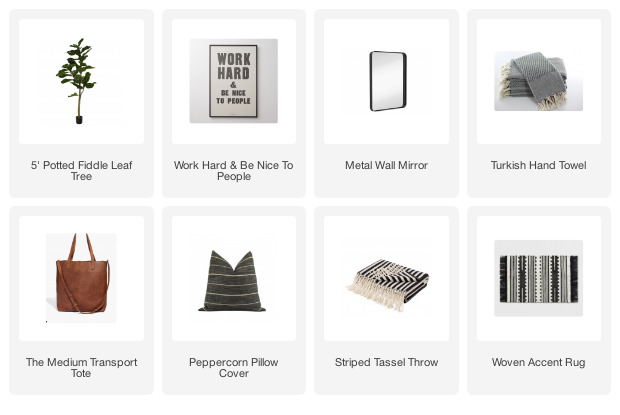 If you don't already have a piece of furniture that you're looking to update then definitely check out that post. 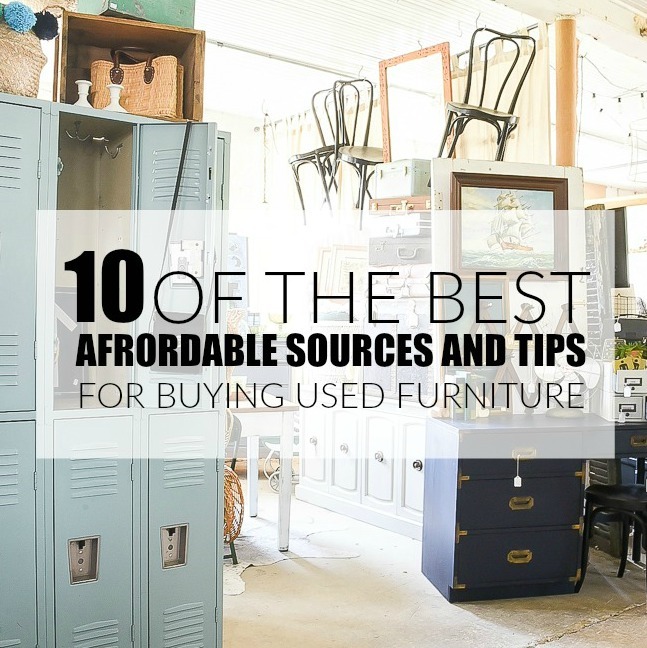 I share all my favorite sources for buying used furniture, including what to look for to make sure you're getting a good quality piece. NOTE: Keep in mind that you may not need ALL the supplies listed to prep and paint a piece of furniture. The type of paint you use and the surface you are painting will impact the prep and finish materials required. 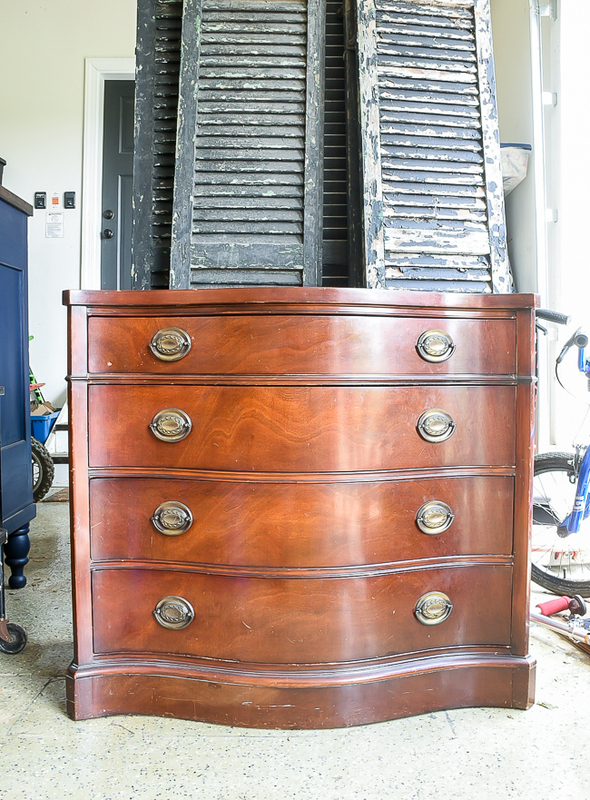 When buying furniture secondhand or updating an old family piece chances are you'll need to make a few repairs before prepping the piece for paint. Whether that's repairing broken corners, removing or fixing damaged veneer, securing loose joints or filling old hardware holes. Making repairs before you slap on a few coats of paint is crucial for getting a clean professional finish. I've tried many wood fillers in the past, but Minwax High Performance Wood Filler is by far my favorite when making major furniture repairs. It dies in 15 minutes, is sandable in 30 minutes and doesn't shrink or crack. 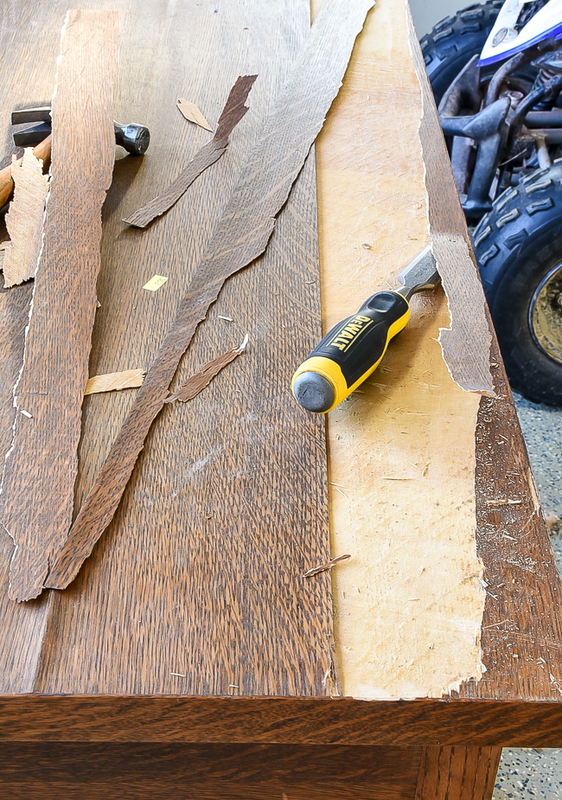 It's great for repairing old hardware holes and chunks of missing wood or veneer. Simply apply the wood filler with a putty knife, let dry then sand it smooth with a sander or sandpaper. If you're dealing with more substantial veneer damage, use a sharp chisel to remove the veneer completely. 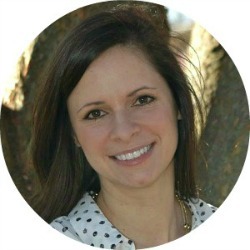 You can check out this post if you're having trouble removing stubborn veneer. When searching for used furniture I always look for solid wood pieces with dovetail drawers. 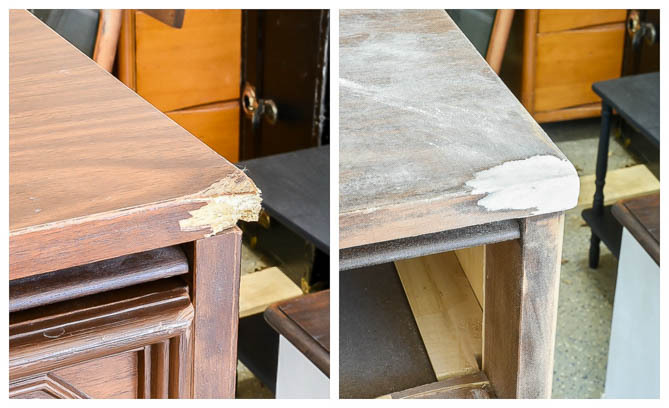 Even though dovetail drawers are a higher quality way of making drawers they can still come loose and need repairing. 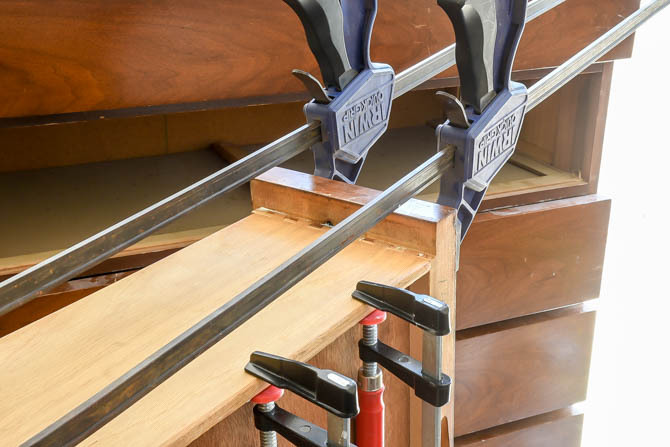 The good news is, repairing dovetail drawers is super easy with these simple steps. ONE: Using a rubber mallet, gently tap the inside of the side of the drawer to loosen the drawer joints completely. TWO: Apply wood glue along the dovetail joints. THREE: Align dovetail joints back together and clamp tight with two long bar clamps. 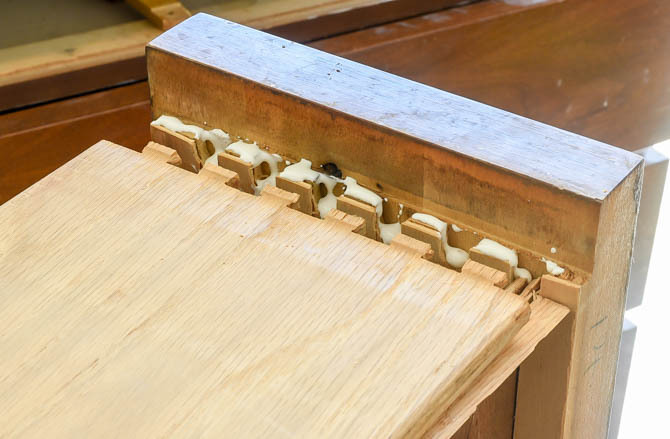 FOUR: While the drawer is clamped tight, wipe around the inside and outside of the repaired joint to remove any access glue. FIVE: Let dry a few hours then remove clamps. 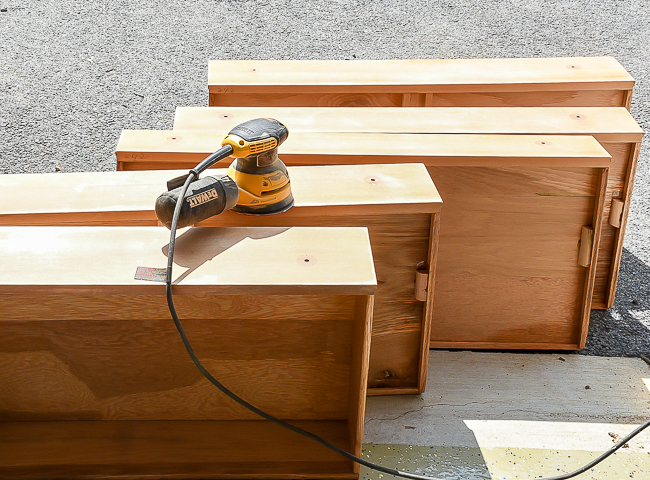 Now that you have old hardware holes filled and any damage repaired, it's time to sand your furniture and get it prepped for paint. This is my least favorite part, but the most important part in ensuring you get a good quality, long lasting paint finish. Keep in mind, chalk paint requires less prep work then milk or mineral paint and may not require sanding. If I'm refinishing a piece of furniture and need to remove the old stain completely, then I like to start with 80 grit sandpaper and work my way up to 120 grit. Otherwise, 100 grit sandpaper is just fine for removing any glossy furniture finish and smoothing out wood putty from repaired areas. It can be a little trickier to remove the shiny smooth finish of Laminate furniture, so I like to use liquid sander deglosser on laminate instead of tradition sandpaper. Liquid deglosser is just a non-messy alternative to removing glossy finishes and prep furniture for paint. After you have your furniture sanded you'll need to clean the piece and prep it for paint. I like to clean all my pieces with Simple Green to remove all sanding dust and residue. Tack cloths are also great for removing dust and fine particles from furniture. 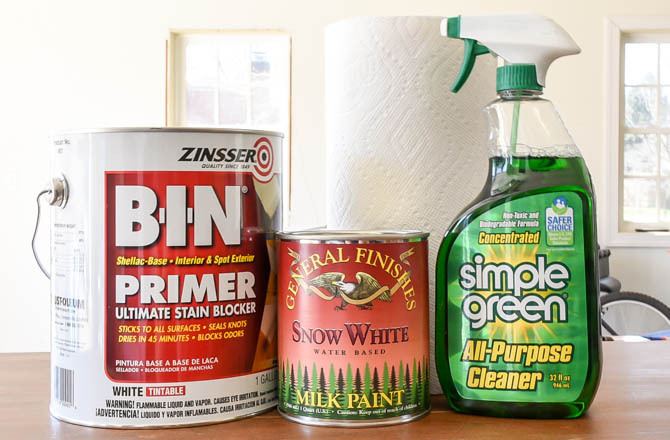 It's not always necessary to prime furniture before painting, but there are certain instances that you definitely want to use a good quality primer before panting. LAMINATE FURNITURE: Even after using liquid sander deglosser I find that I get the best coverage and adhesion on laminate furniture when using a shellac primer. The best primer I've come across is Zinsser BIN shellac primer. DARK STAINED FURNITURE: Always use a primer when painting over dark stained wood, especially if you are using white or light colored paint. Otherwise, the stain and wood will bleed through your paint and you'll end up with a blotchy uneven finish. PAINTING FURNITURE WHITE: I always prime all furniture pieces that I plan to paint white. White paint has less pigmentation than other paint colors and traditionally requires more coats. Priming first ensures you won't have bleed through and helps reduce the coats of paint required for good coverage. Now it's time for the fun part, paint! I like to use a brush when painting furniture and usually use my go to Purdy paint brush. There's a variety of paint types and brands to choose from (milk paint, chalk paint, mineral paint, etc. ), but regardless of what paint you choose, you'll want to apply it in long even strokes (from left to right or vice versa) to reduce brush marks. Keep an eye out for paint drips, especially around edges and detailed carvings and spindles. 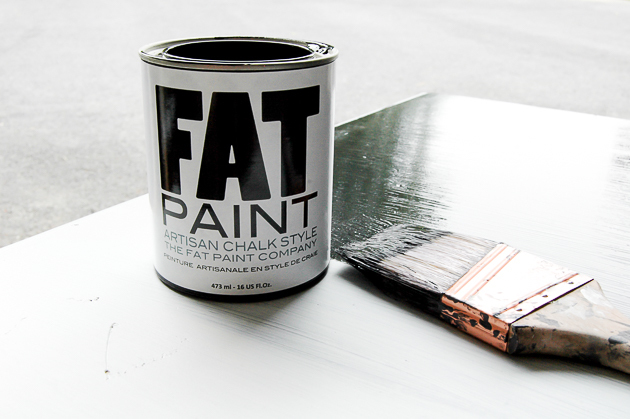 I usually apply 2-3 coats of paint and lightly sand in between coats, especially if I'm using chalk paint. Wax: Hardens and seals furniture giving it a gloss or buff appearance. Clear Polycrylic: Clear, ultra-fast drying and durable protective top coat. Depending on the look and durability you desire will depend on whether or not you use wax or clear poly to seal your furniture. Wax can give furniture a beautiful finish but will need to be reapplied often. Let's break down the differences between wax and poly to help you get a better idea of the best product to use for your project. DURABILITY: Polycrylic hardens to a durable, wipeable finish and is good for high traffic pieces. Wax is only a semi-permanent finish and may never harden, making it better suited for show pieces. WEAR: Wax scratches and stains easily and will wear over time where poly has a much harder finish and is scratch resistant. FINISH: You will get an even finish with both products. Poly may leave brush strokes where wax will leave a buffed, smooth finish. WIPEABLE: Poly is easy to clean and can be wiped down without damaging the surface of your piece. Wiping furniture that's been sealed with wax is likely to damage the finish and remove the wax. You'll see in a minute how I damaged our side table trying to wipe up spills and remove stains. COST: Minwax water based Polycrylic (the brand I use) is about $18.00 for a quart while wax can be upwards of $30+ for less product. DRY TIME: Poly will dry in a few hours where wax can take days to fully cure. 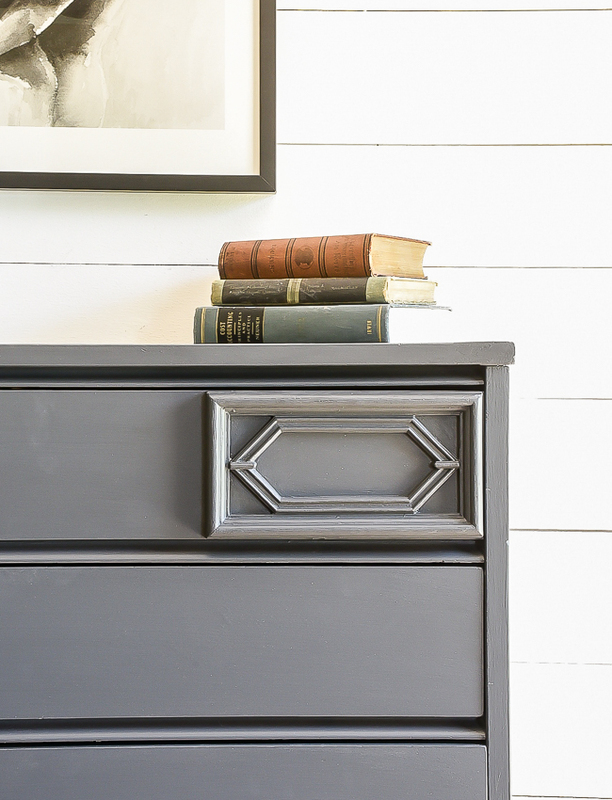 COLOR: Dark wax allows you to age a piece of furniture where a glaze must be used with poly to get a similar look. 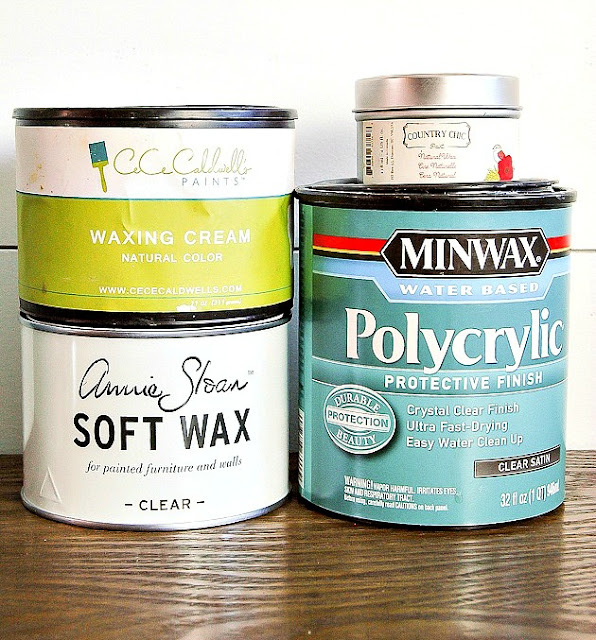 You don't have to use chalk paint in order to use wax to seal your furniture. You can apply wax over any type of paint and achieve various looks from a smooth gloss finish to a distressed aged look. Using dark wax over clear wax is the best way to achieve an aged look and add character to pieces with carvings and unique details. 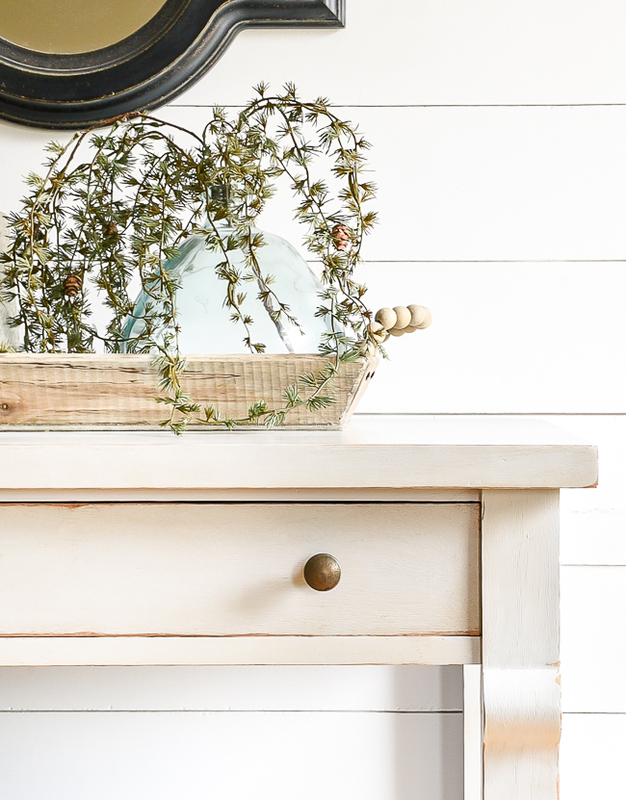 First, apply a layer of clear wax to your painted furniture using a wax brush or lint free rag. Let the wax dry a few minutes then buff out and wipe off any excess wax using another clean lint free rag. 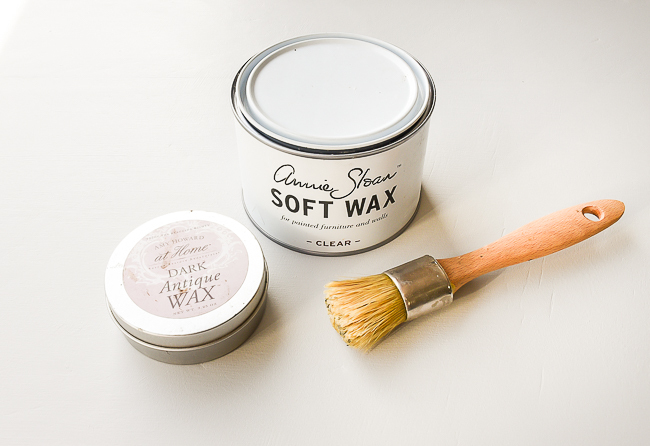 Apply dark antique wax over the clear wax using another wax brush or lint free cloth. Using the same brush, rag or 000 steel wool, blend the dark wax into any groves and details. This will give depth to your painted piece and allow details to pop. 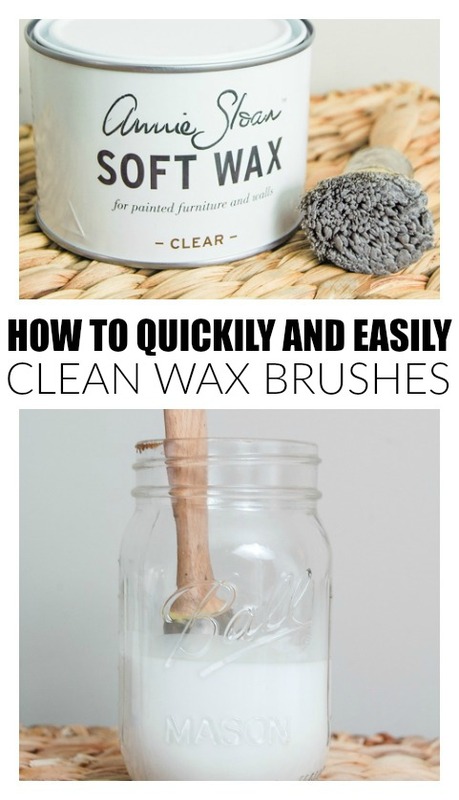 If you find that you added too much dark wax you can "erase" the wax by going over it with more clear wax. No matter if you're a seasoned furniture painter or have never painted before. Updating old furniture with paint is the easiest and most affordable way to give life back to damaged or dated furniture. There's nothing more satisfying than finding an affordable used piece of furniture and turning it into something beautiful and perfect for your home. Do you have any other furniture painting questions that I may have missed? I'd love to include them and answer any other questions you may have. Amazing post! So great to have all this information in one place - thank you. This is some great information. Thank you!!! I've been wanting to try my hand at this, just haven't been able to bring myself to painting old furniture. I think I'm ready. Good instruction!!! Thank you, thank you, thank you. Love having the information in one post. Thank you!This is good information and much appreciated.